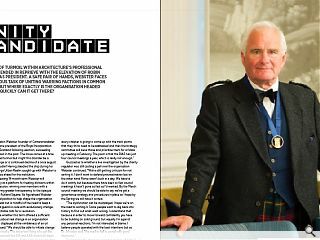 The professional body for architecture in Scotland has earned a reprieve from the turmoil which has rocked it in recent months with the elevation of Robin Webster as president. A safe pair of hands, Webster faces the arduous task of uniting warring factions in common purpose, but where exactly is the organisation headed and how quickly can it get there? 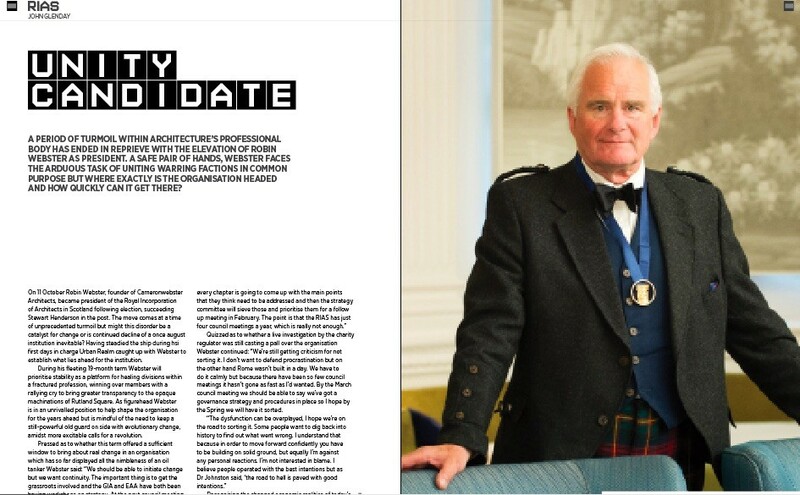 On 11 October Robin Webster, founder of Cameronwebster Architects, became president of the Royal Incorporation of Architects in Scotland following election, succeeding Stewart Henderson in the post. The move comes at a time of unprecedented turmoil but might this disorder be a catalyst for change or is continued decline of a once august institution inevitable? Having steadied the ship during hsi first days in charge Urban Realm caught up with Webster to establish what lies ahead for the institution. During his fleeting 19-month term Webster will prioritise stability as a platform for healing divisions within a fractured profession, winning over members with a rallying cry to bring greater transparency to the opaque machinations of Rutland Square. As figurehead Webster is in an unrivalled position to help shape the organisation for the years ahead but is mindful of the need to keep a still-powerful old guard on side with evolutionary change, amidst more excitable calls for a revolution. Quizzed as to whether a live investigation by the charity regulator was still casting a pall over the organisation Webster continued: “We’re still getting criticism for not sorting it. I don’t want to defend procrastination but on the other hand Rome wasn’t built in a day. We have to do it calmly but because there have been so few council meetings it hasn’t gone as fast as I’d wanted. By the March council meeting we should be able to say we’ve got a governance strategy and procedures in place so I hope by the Spring we will have it sorted. 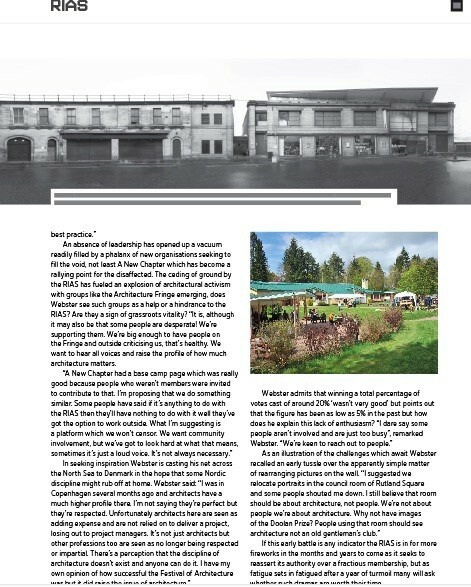 Amidst endless talk of governance, probity and transparency it is bread and butter issues of procurement, fees and planning which truly fire Webster who is an ardent champion of competitions as a means of fostering architectural talent. He said: “A lot of people express doubts about competitions, but I think a well-organised two-stage competition doesn’t need to cost the profession a lot of time.” Webster will also push for reform of much maligned Pre-Qualification Questionnaires (PQQs) by enshrining a minimum as well as a maximum fee so that ‘if people bid too low they are automatically discounted because a race to the bottom isn’t helping anybody’. 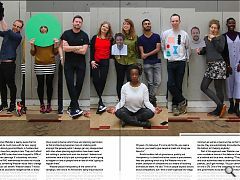 An absence of leadership has opened up a vacuum readily filled by a phalanx of new organisations seeking to fill the void, not least A New Chapter which has become a rallying point for the disaffected. 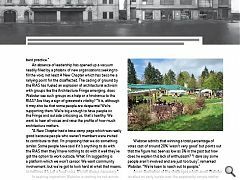 The ceding of ground by the RIAS has fueled an explosion of architectural activism with groups like the Architecture Fringe emerging, does Webster see such groups as a help or a hindrance to the RIAS? Are they a sign of grassroots vitality? “It is, although it may also be that some people are desperate! We’re supporting them. We’re big enough to have people on the Fringe and outside criticising us, that’s healthy. 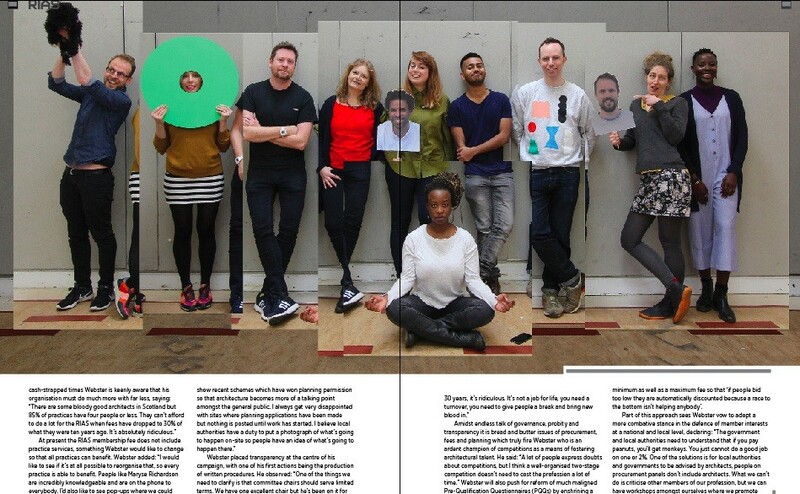 We want to hear all voices and raise the profile of how much architecture matters. If this early battle is any indicator the RIAS is in for more fireworks in the months and years to come as it seeks to reassert its authority over a fractious membership, but as fatigue sets in fatigued after a year of turmoil many will ask whether such dramas are worth their time.